Extang Solid Fold 2.0 Bed Cover: Improve gas mileage by up to 10%, protect your cargo, and look good doing it! 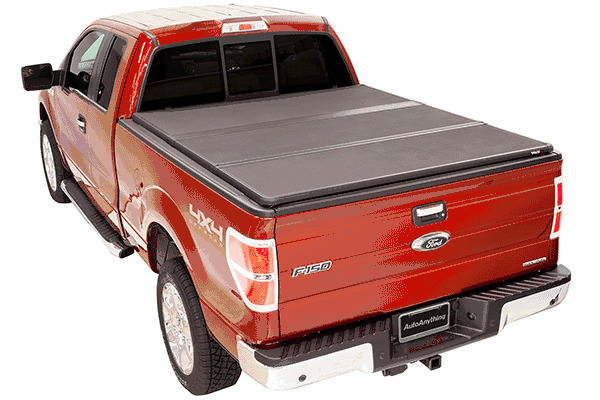 The Extang Solid Fold Tonneau Cover is the perfect solution for your truck. This hard lid folding tonneau installs in minutes and requires no tools or automotive knowledge to install! 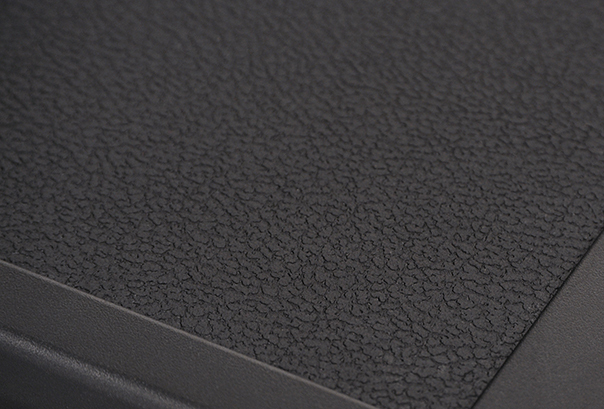 The Extang Solid Fod 2.0 is made with TPO dent resistant panels. This also makes the cover cooler to the touch on warm days and gives the cover a clean factory look with a textured matte finish. The integrated snap on seals make the Solid Fold 2.0 Cover the most weather resistant folding cover on the market, built to withstand the harshest of weather conditions. The Extang Solid Fold 2.0 can easily be folded out of the way, to allow ease of loading or quick convenient access to cargo. You also can drop the tailgate with the solid fold completely closed. 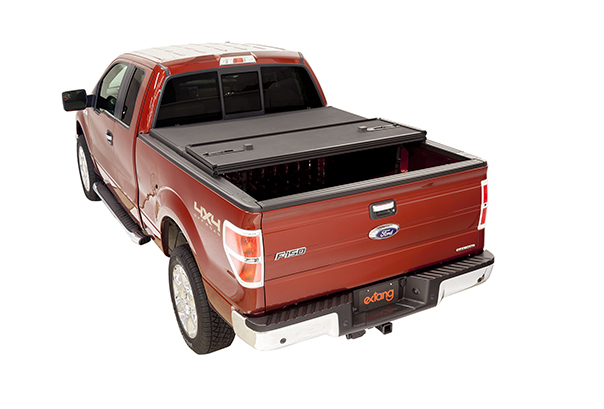 The Extang Solid Fold Tonneau Cover 2.0 is designed specifically to fit your trucks make and model for a superior fit!. Trucks with spray on and under rail bed liners have nothing to worry about either! The Solid Fold 2.0 still fits perfectly! If you have an over the rail bed liner, you'll need to cut notches into it in order for the Extang Solid fold to fit properly. If you have aluminum or stainless steel bed caps, you'll need to remove them in order to achieve a flat surface for closing your Solid Fold Bed Cover. The part number for this item is Extang 83488 and it fits 2017 Ford F-250 F-350 Super Duty (8' Bed Models). The Extang Solid Fold 2.0 Tonneau Cover installs in minutes with no tools or automotive experience required! You can do this installation yourself with the help of the simple, easy to read instructions that include pictures. 1. The Extang SOLIDFOLD tonneau top comes fully assembled. Note any damaged or missing components before installing. 2. Wash truck bed before installing your Extang Solid Fold Tonneau Cover. 3. Place the already assembled Extang Solid Fold Tonneau Cover over cab end of the truck bed and then unfold the cover fully and adjust position over the truck bed for proper cab/tail alignment. If the cover does not fit, do not proceed. 4. Carefully refold the cover without shifting its position on the truck bed. 5. Slide front clamps out and hand tighten until clamp securely contacts downstanding metal edge of bed wall then tighten an additional 1/2 turn. Ensure that clamp is positioned under the metal bed wall edge of truck. Do not secure to only lip of bedliner or rail cap. Be careful not to overtighten. 6. With tailgate open and front clamps secure, completely open the Extang Solid Fold cover. 7. Slide rear clamp out to the bed wall. Pull rear clamp down and hook under downstanding metal edge of bed wall flange. 8. Release the rear clamps. Before folding the second section of the cover, rear clamps must be stowed securely into rail. 9. Fold the cover forward and fasten the straps in the middle section to the front rail. Your installation is now complete. Enjoy your new Extang Solid Fold Tonneau Cover and thank you for shopping at New Level Motor Sports!